Okay! So! I was not thrilled with The Maze Runner as a trilogy, BUT (!) that does not mean that all is lost. As I mentioned in my review, The Maze Runner is the best of the three, and I think this is going to be one of those rare cases in which the movie is better than the book. A trailer hasn’t been released yet, but there are publicity stills floating around the interwebs. I have to say, the casting on this movie is FLAWLESS, at least in terms of how I personally imagined each character. Take a look. I think you’ll find there’s a little something for the fangirl in everyone. Thomas, played by Dylan O’Brien, who you know as Stiles MTV’s Teen Wolf. Newt, played by Thomas Brodie-Sangster, who you know as Jojen Reed from HBO’s Game of Thrones. Minho, played by Ki Hong Lee. I don’t know him from anything yet, but he’s one of my favorites so I had to include him. 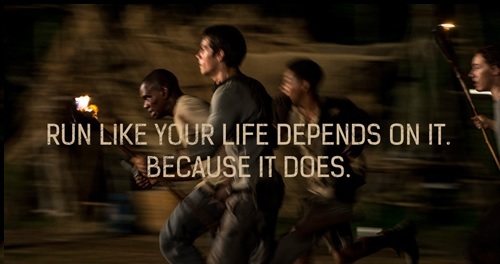 All images are from themazerunnermovie.com. In light of The Maze Runner movie coming out later this year, I thought I’d get a jump on the story by reading The Maze Runner trilogy by James Dashner over the weekend. It was probably the most frustrating reading experience I’ve ever had in my life. Brief Synopsis: Thomas wakes up alone in a lift with no memories other than his own first name. When the lift opens, he finds that it has delivered him to “The Glade,” an open arena surrounded by giant stone walls that form the maze. He and the 50 other boys (and eventually one girl) who live in the Glade, have to solve the maze, but they don’t know how or why. Throughout the trilogy, we learn that the outside world has been ravaged by sun flares that reached the earth and threw the planet into chaos. In addition, a deadly virus, dubbed “The Flare,” was inadvertently released and is killing the remaining population. Thomas and the other “Gladers” are immune to the virus, so their brains are the key to discovering the cure. Horrible things happen to them inside and eventually outside of the maze, all in the name of science and studying their reactions to said events inside their brains. If the scientists, aka the WICKED organization, can create a blueprint for an immune brain, they feel they can find a cure. But who can actually be trusted? Who is actually the good guy? How far is too far? Trilogy Rating: Based on my star average for the three separate books, the whole trilogy gets a 3/5. If you’re the type that likes to read books before seeing the movie, then by all means, read The Maze Runner. It was a very enjoyable and unique read. In my opinion, you can skip the final two books and not miss anything. Also, I’m predicting that this will be one of those rare cases in which the movie is better than the book. Overall Impression: Honestly, not much stands out for me in this book because it felt like pure filler. The Gladers set out to complete Phase 2. They’ve left the maze and are now trying to navigate the Scorch, the completely destroyed and barren desert remains of the areas around the Earth’s equator. More horrible things happen, but we aren’t given any answers in terms of why or how they are happening. Also, there is zero character development. I didn’t enjoy this read very much. It’s a hopeful 2 stars, in that I’m hoping it’ll pick up after to the dreaded Second Book Slump. Overall Impression: So mind numbingly FRUSTRATING. I’ll discuss specifics below, but overall, I kind of hated every second of this book. I saw another review that referred to this last book as the “written version of a Michael Bay movie” and that assessment is so spot on. We jump from one fight to the next, one explosion to the next, one problem to the next, all the while having no character development whatsoever. The third book in a nutshell: Problem arises. Make a plan. Plan fails. Succeed anyway. Repeat. Over and over and over again. It’s overkill. And I won’t even touch the completely out of left field, cop out of an ending. Just ugh. So, right in the beginning of book 3, Thomas has the opportunity to have his memory restored. Finally. FINALLY! All that the readers need for all of our questions to be answered is for Thomas to get his memory back. AND HE REFUSES. Other characters get their memories back, but we aren’t in their heads so that’s useless. Thomas gets the same opportunity mid-story and refuses AGAIN. Seriously, WTF? You set up all of these questions and scenarios but readers are supposed to accept “variables” as the answer to everything? I’m sorry, I don’t care that I’m not the intended demographic for this story, that’s lame no matter what age you are. Frankly, it makes me think that the author had no idea where to take the story once the Gladers left the maze. He didn’t know how to answer the questions and instead of coming up with satisfying answers, he tried to hide them with explosions and and hand-to-hand combat. I like a good fight scene as much as the next person, but when there’s a blow out confrontation in every chapter, it gets boring. The lack of character development in the last two books also made it very hard to care about important deaths, including the death of my favorite character from book 1. I wanted to care, but all the characters devolved into bland, boring and predictable shells of themselves. All in all, if you like answered questions and closure with your reading experiences, avoid this series at all cost. You will get neither here.